This Spring the tulips are a sunny, yellow Darwin Hybrid called Golden Oxford – among the most weather resistant of all garden tulips with large flower heads and strong stems. 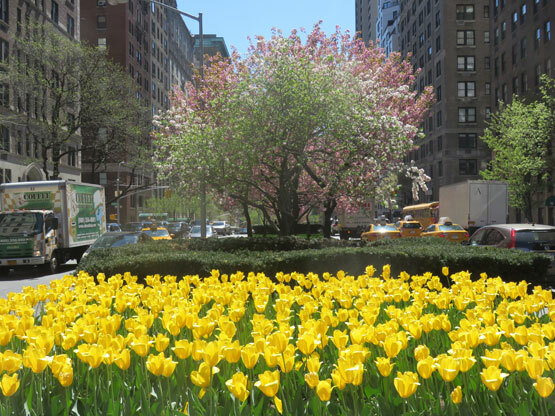 After the Tulips have finished, the Park Avenue Fund hosts a “Park Avenue Tulip Dig” – a longstanding tradition that allows members of the community to dig up the spent bulbs for future use in their own gardens. that is lovely to know! Have strolled Park Ave several time. The tulips are beautiful. I know you must be missing your Webster. Bless his heart. Any thought of a new puppy:)?